"Having used the Fastnet Salmon Gye Landing Nets for the last two seasons on the famous Park Beat, we highly recommend this net for any salmon angler; light, strong, and very comfortable to use with confidence. Believe me, these nets have been put through some testing times over the last two seasons, without any problems what so ever." Please allow 7-10 working days for your order to be processed and your landing net to be despatched. Add these products to your order for no extra delivery costs. Both the rim and shaft are manufactured from aluminium as it is extremely versatile and the world’s most abundant third most common element comprising 8% of the earth’s crust. It has a unique combination of properties which combine lightness, strength, durability, and corrosion resistance. A wide range of alloys are available to exploit these properties to the full yet we have gone a step further and designed a unique alloy that provides the best strength-to-weight ratio for each Fastnet landing net design. WHY AGE HARDENED AND TEMPERED? Your landing net rim and shaft are put through a heat treatment process to age-harden and temper the aluminium. As aluminium gets stronger as it gets older this stimulates the ageing process to the point of maximum strength. WHY THE DIAMOND & HEXAGONAL SHAPE? When landing your catch pressure is applied to specific areas of the rim and shaft. The alloy is designed to withhold pressure in these areas whilst remaining lightweight. WHY THE ANODISED AND NON ANODISED FINISH? Aluminium responds well to a variety of finishing methods; each provides an attractive and highly durable finish. Many Fastnet shafts are anodised to provide added protection against oxidisation and to create a sleek finish. The salmon net shafts are the only exception to this rule as they take a lot more punishment. 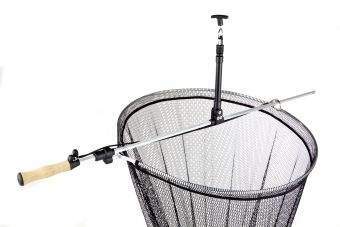 Oxidisation takes many years to manifest therefore a properly cleaned and stored landing net will last a lifetime. Despite initial appearances this is not made from "plastic"! All knuckles and other key components are manufactured from nylon glass toughened resin, the very best composite mix of materials, ensuring exceptional strength. Another benefit to this design is that it significantly reduces net bag snagging. Each knuckle is custom moulded for each style of landing net. For non-EU countries listed below the postage charge excludes any duties and taxes that may be charged on receipt of goods. If your country does not appear please email info@fastnetdevelop.co.uk for a quotation. Enter your question below along with your email address and name. Your email address will not be shown on the site when we have answered your question. Please check back to find your answer.